Maine is located in the northernmost east corner of the United States, nicknamed The Pine Tree State and has a population of 1.3 million people. The capital city is Augusta but the largest city is Portland, which is home to 66,000 people. 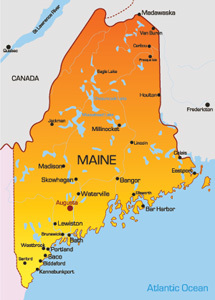 The only state bordering Maine is New Hampshire due to half of the state being on the Atlantic Coast. The major highways serving the state are I-95, I-295, I-395 and I-495. Notable universities in Maine are the University of Maine and University of Southern Maine, which together have over 20,000 students. Maine is also a popular tourist destination because of the many coastal towns like Portland, Brunswick, and Biddeford.